Jay Herman Wobser, 92, passed away Saturday, June 23, 2018 surrounded by his loving family. Jay was born on August 24, 1925 to Herman and Alice (Bradley) Wobser in Toledo, OH. He graduated from Burnham High School in 1943. Jay attended UT School of Engineering, and was employed at the Toledo Scale Co. for 32 years, retiring in 1979. 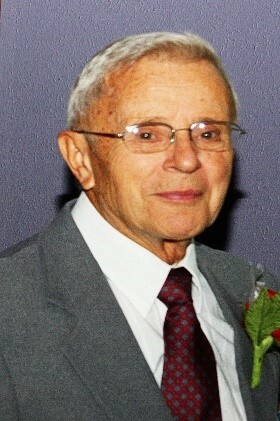 He then worked at Jacobs Plastics in Adrian, MI, D&H Machinery, and Sears. He was treasurer of the Toledo Scale Credit Union for many years. Jay was a member of Olivet Lutheran Church all his life and enjoyed singing in the choir since his teens. He was a member of the Olivet Leisure League, the New Life Group, and was a dedicated volunteer at Lutheran Social Services, and Lutheran Homes Society. Jay married Joann Jacobs in 1949 at Zion Lutheran Church in Ottawa Lake, MI. Jay and Joann spent the winters in Florida, attending Spirit of Grace Lutheran Church in New Port Richey, where Jay sang in the choir. Jay is survived by his sister, Lois Brinning; children, Sandi (Jim) Radde and Greg (Sue) Wobser; grandchildren, Kim (Art) Garza, Brian (Stacey) Radde and Greg Wobser II; great grandchildren, Belle Garza, Alivia Garza and Jacob Radde; and many nieces, nephews and friends. He was preceded in death by his wife Joann in 2015, brother John Wobser, sisters Ruth Brown and Janet Melrose. Visitation will be at Olivet Lutheran Church, Thursday, June 28, 2018 from 10:00 to 11:00 a.m., the funeral service will begin at 11:00 a.m. Interment will be at a later date. Memorials may be made to the Olivet Lutheran Church Senior Choir.